In this special Christmas episode of the Tales of Sigmar Podcast, Dan and Chalmers cover the recent FAQ and the reveal of the Disciples of Tzeentch Battletome. They also recap their favourite moments of their hobbying throughout 2016 while looking forward to what they hope to see and achieve in 2017. As you can probably imagine for Dan the majority of it is based on Moonclan Grots. A very Merry Christmas from all three of us and hope you have a great 2017. Welcome to Episode 10 of the Tales of Sigmar Podcast. For the first time in a few episodes we've got the whole team back together as Dan, Adam and Chalmers have a good old catch up. 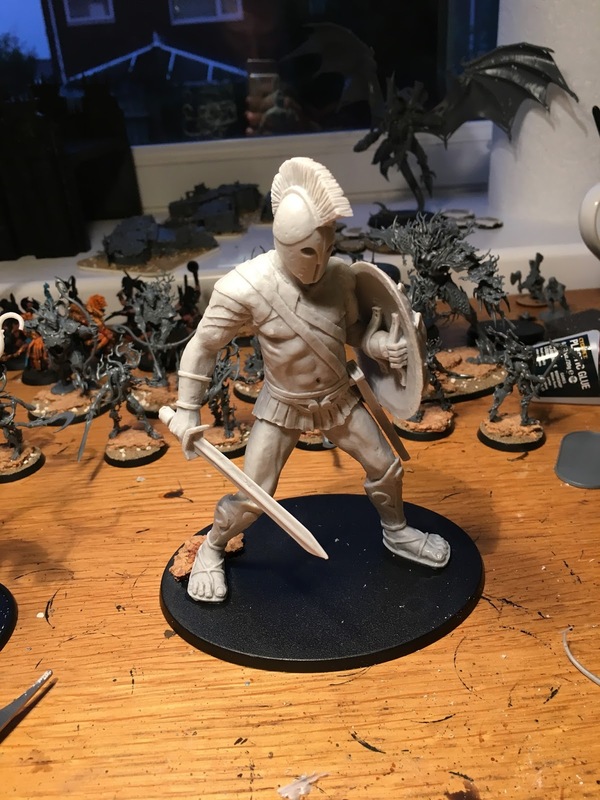 We cover our hobby progress over the past few months, briefly touch on Blood and Glory, discuss compendium warscrolls, get a bit too excited for the Narrative Realm Hoppers event we're all attending in February and answer questions from you guys. 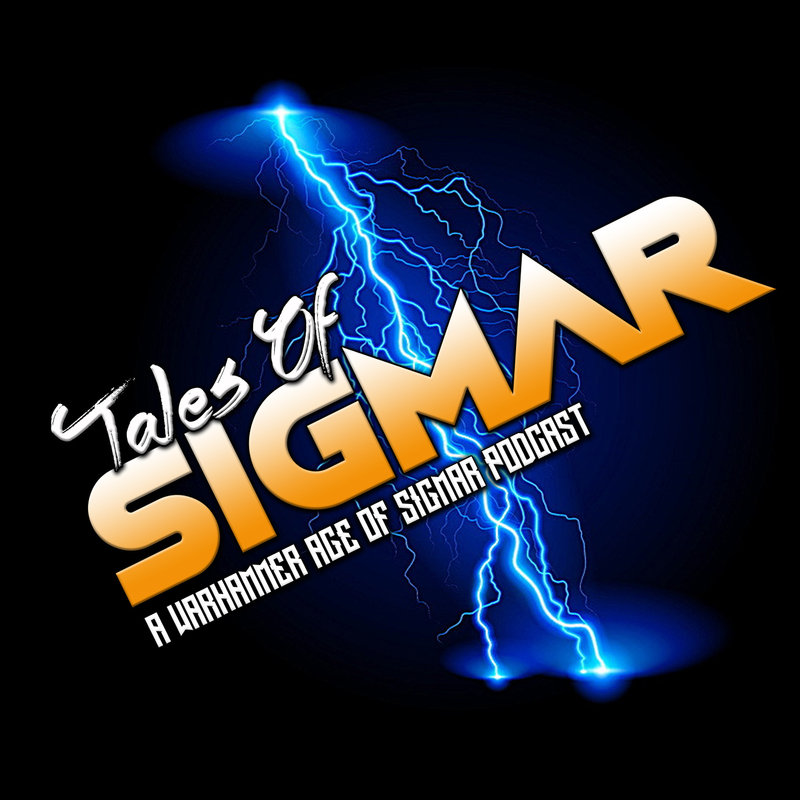 Welcome to Episode 9 of the Tales of Sigmar Podcast! We're finally back from our mini-hiatus due to real life, in this episode Dan interviews Sam Davies, the Facehammer GT champion. During this episode Sam discusses his approach to Matched Play events in the Age of Sigmar, as well as some advice on attending tournaments, list building and life itself! So I’ll admit trying to build 110 Plague Monks was going to be a tough task to get done for Blood and Glory and it’s officially broke me. Don’t get me wrong I really want to get the Clan Pestilence army done but I think this is going to have to be a slow grow project rather than rushing it out for a tournament. Thankfully I’ve been getting through all my Ironjawz over the past few weeks and now with just under three weeks to go until the tournament I’m well on schedule of having a full Ironjawz army ready for the event. So what’s in my list? This is the first time I’m going to be using a Batallion in a game and with it I now have a 5-drop army. But I really think you’re going to struggle to build a competitive Ironjawz list without the Ironfist Batallion. Basically it gives you an extra D6” movement in your hero phase on all of your Brutes and Ardboyz, plus one of the Brutes can become a Big-Boss and has 5 wounds instead of 3. And yes that extra D6” stacks with the Destruction Rampaging Destroyers allegiance ability allowing them to move 2D6”+2” (because of Ravager trait) in your Hero phase, meaning suddenly your 4” movement Orruks are one speedy mob! Attending Facehammer GT with a mixed Destruction list the D6” was great to get up the board Turn 1 so I can imagine how quickly the Ironjawz are going to be in the face of the opponents/getting straight onto objectives at Blood and Glory. I’ve chose the Megaboss on foot as my General mainly because the Megaboss on Grumpkin (Grumpy Pumpkin) is too much of a fire target to be kept safe. Plus you want the Mawkrusha up the field rather than babysitting it from things such as teleporting Retributors which happened in two games at Facehammer. So I’ve given the extra artefact to my Mawkrusha and given it the 4+ save against Mortal Wounds. It’s still probably going to die most games and it is a lot of points, but hopefully it’ll prove a big enough distraction piece for the rest of my army to do the business up the field. Now you’ll notice a lack of Gore Gruntas in my list and an abundance of Ardboyz. I absolutely love the Gore Grunta models but their rules are just a little meh. For exactly the same cost I can run a 10-man Ardboyz unit that has 20 wounds, and depending on what weapons I’ve given them either 20 or 30 attacks. And in the General’s handbook where most models hold objectives have three units of 10 Ardboyz will be good objective grabbers compared to the 3 Gore Gruntas. I’m excited to use a big block of 10 Brutes. They were really good as a 5-man unit at Facehammer GT so I’m hoping having a big block of 10, buffed by the Warchanter and supported by the Megaboss on foot they’ll be able to really deal out a lot of damage. My 10-man unit will be equipped with the Gore-Hackas for the extra reach, while the 5-man unit will be equipped with the two hand-weapons to deal out more attacks per a model. So exactly what do I have left to do for Blood and Glory? Well I’ve got to finish painting up 15 Ardboyz, build and paint another 15 Ardboyz. Then base the rest of the army. 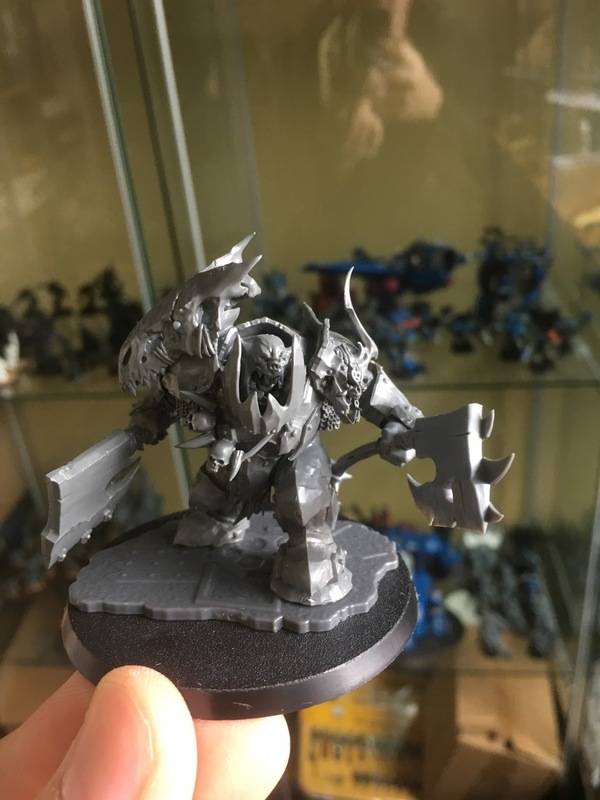 Thankfully I’ve already painted up the extra 10 Brutes, Warboss and Warchanter and I already had the Mawkrusha, 5 Brutes and Weirdnob Shaman painted for Facehammer GT. I'm actually quite ahead of schedule and hopefully by the end of the weekend, the 15 Ardboyz will be finished and the other 15 will at least be primed, maybe basecoats put down on them. I’ve already signed up for the 1,000pt and 500pt events on the Friday too. 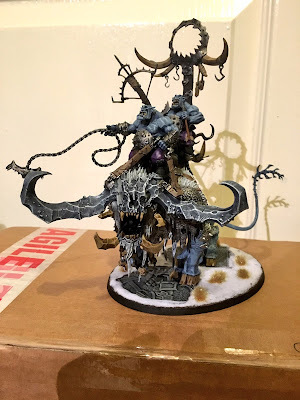 My original plan was having different Grand Alliances for each event however I have a feeling I’ll be chopping and changing my Ironjawz to fit in each tournament. At least that way I’ll have some practice for certain units in the army before the main 2K championships on the weekend. 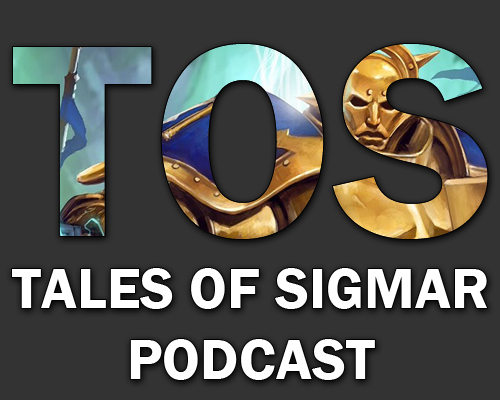 Welcome to Episode 8 of a Tales of Sigmar Podcast, this week Chalmers is away so Dan and Adam host a hobby-orientated episode in his absence. The guys cover their hobby progress, Adam's run up to the Clash Comp at the end of the month and Dan gets super...SUPER excited over the official reveal of Magnus The Red on Warhammer TV. So now the very awesome Facehammer GT has been and gone, full tournament report in a podcast episode coming very soon, it’s time to look ahead and decide what I’m going to be working on in the upcoming months. I think Chaos is going to be the Grand Alliance of choice over for the rest of the year and beginning of 2017. I’ll be doing two different armies over the next few months in preparation for both the Blood and Glory event in Derby at the end of November and also the Realm Hoppers narrative event hosted by HobbyHammer in February. 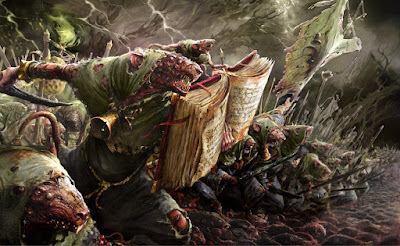 The plan for Blood and Glory is bring along a full Skaven Pestilence list for the 2,000pts Championship event. I’ve got all the models and decided on a list, I’ve even got themed terrain planned. But with six weeks to go (I see a reoccurring theme here for every event) I’ve got the whole army to build and paint up. Thankfully the core of the army is 110 Plague Monks and they’re pretty easy to batch paint up. Along with that I need a Plague Priest, two Plague Furnaces and three Plagueclaw Catapults. It’s no piece of cake I assure you but by painting 20 Plague Monks up at a time I should have more than enough time to get it all sorted. My plan is to get everything built so I can get some practice games in and then paint up the army unit by unit. I think with so many Plague Monks I might do a unit of 20 and then ‘reward’ myself with one of the bigger models in the army. As mentioned I’ve got plans for terrain to bring to the event too. My idea is to have a Skaven warpstone mining theme. I’ve bought a TT Combat Wild-West Industrial mining kit, it has railroads, mining carts and walkways. I’m hoping adding some warpstone crystals, some rats and the like I’ll be able to turn it into a Skaven mine. I’ve also got a lot of larger Warpstone Crystal chunks from the Dice Bag Lady which will be used as scatter terrain for warpstone ‘fields’ on the table. If I pull it off it should look good. If it looks questionable I’ve got the normal AoS terrain to fall back on and use. For the Narrative event in February I’m going to be bringing a Skarbrand-led Khorne alliance. My backstory is that Skarbrand, being exiled by Khorne himself is starting a Khorne Rebellion and the Daemon and Bloodbound forces are coming to follow under Skarbrand. Again I’m planning some Khorne themed terrain and objective markers and cannot wait to get into this. I’ve already made a start on a start collecting box set. 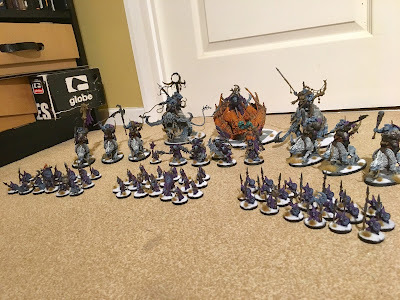 I’m hoping to have the majority of the army done way in advance, and hope that a certain Santa Claus helps out the Mrs and Skarbrand himself is sitting under my Christmas tree this year. On top of all of this I’ve finally managed to get the Newcastle Warlords Wargaming Group set up and running. Our first night will be next Thursday October 20th and so far we’ve got a good mix of people attending with AoS games being organized as well as 30K and Malifaux. We’re going to be meeting every three weeks and I’ve been busy getting boards put together and trying to stockpile and paint as much terrain I can muster over the last few days. So it’s all hands on board to get the first club night running smoothly and without a hitch. Then the road to Blood and Glory begins! 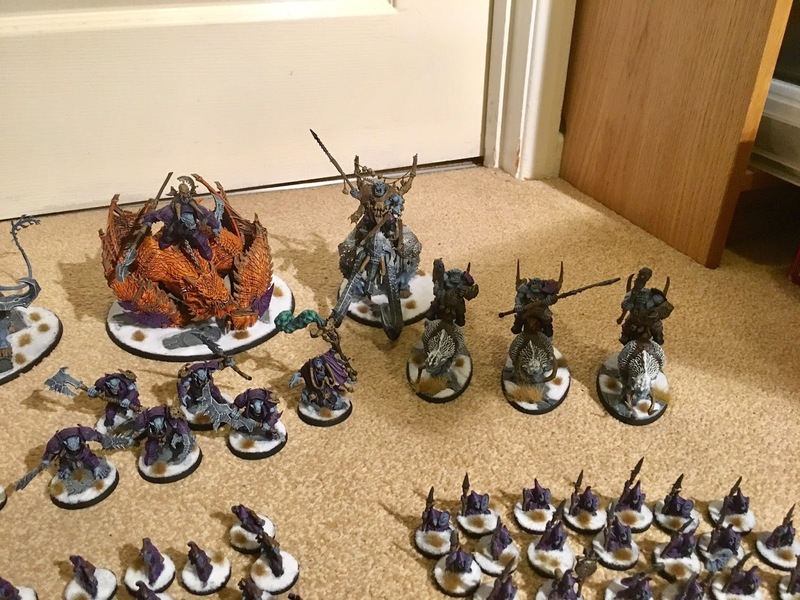 Yes I've managed to finish the whole Destruction army in record time, so much so for the first time ever I'm not going to be painting the night before the tournament. I know the list isn't optimal at all, but I'm going to have fun and meet loads of people, if I get a win then great, if not I'll be propping up the bottom tables with a frequent trip to the bar all weekend. Unfortunately I don't think I'm going to have time to do any scenery for the army. If I wasn't ill for a whole week I probably would've had this past week to paint up themed scenery, but hey you can't win them all. 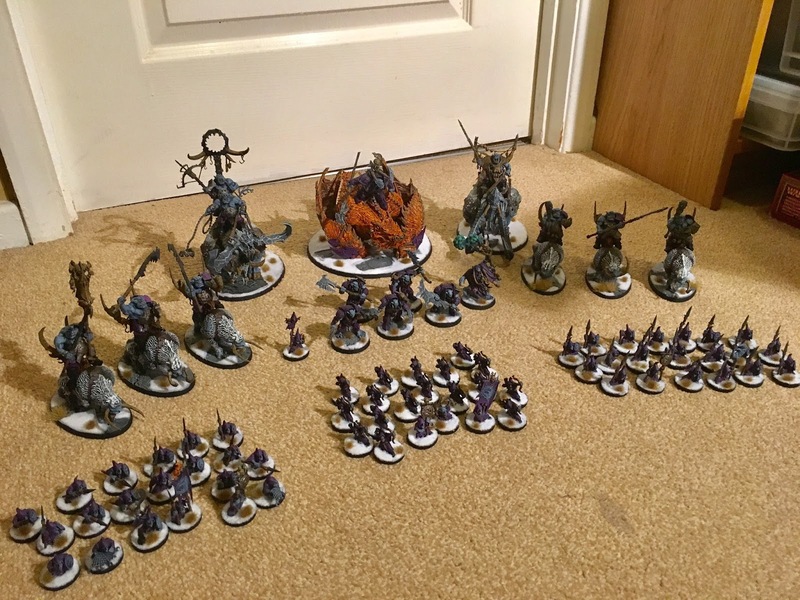 The army allows me to expand out each allegiance over time but using the same colour scheme it will tie into one massive Destruction Grand Alliance that should look cohesive. Now to bring on Friday and the Facehammer GT! We have our very first guest for the Tales of Sigmar podcast as Tyler Mengel joins Dan and discusses everything to do with The Endless Deserts and his fantastic work with the Tomb Kings in Age of Sigmar. 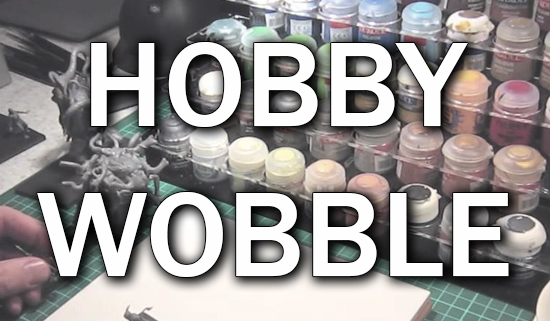 For the hobby progress Adam and Chalmers go through their recent painting and gaming as the days until the Facehammer GT looms near. As you can see we also have a brand new Podcast logo as we reveal the winner of our design a logo competition. So I’m finally back. I’ve been ill and bed-ridden for what’s felt like an eternity, and I’m finally getting back to some sort of normality. Just what I needed with only a couple of weeks until the Facehammer GT. Now the rush is definitely on. 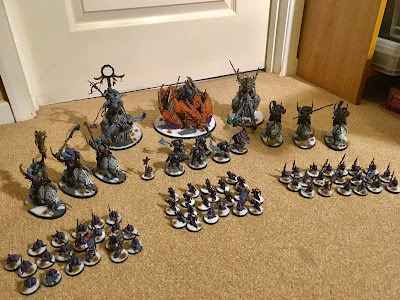 I’ve chopped and changed my Destruction army a few times the past week, I need to get a list which is easy enough to finish off painting and will look decent on the table. I know it’s not going to be anything near an ‘optimal’ list that I wished for but I’m just glad I’ll have something new painted up for the event. 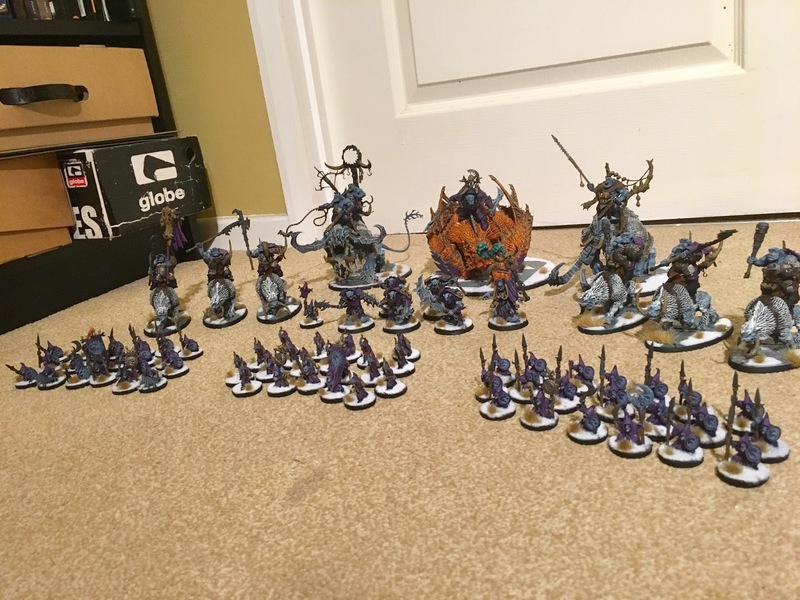 So I’m feverously painting away the past few nights and hopefully by Thursday the army should be fully painted up and ready for the tournament. 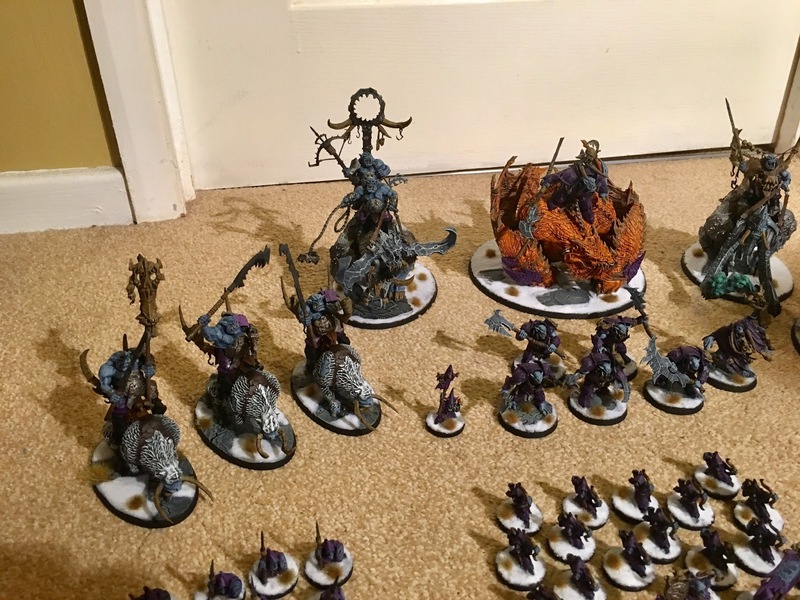 I’ve currently got 20 Moonclan Grots to finish painting, the Moonclan Grot Shaman to paint up and four of the Mournfang Riders to build and paint and then I have to base the whole army with the snow and dead grass. Should be pretty doable over the next couple of nights. 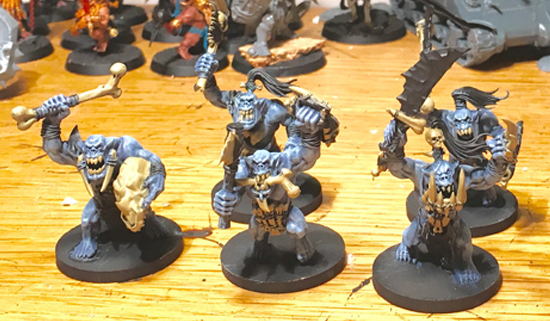 I’m not planning to create a masterpiece for this army, I switched to the Moonclan Grots because they’re easy to speed paint, mainly drybrushing all the robes and skin. Down the line I’ll expand out with more Ironjawz and Bonesplitterz. I think when I do that I’ll take a lot more time in getting them painted up and try to make them the best I can. But for the Facehammer GT it’ll have to be speed-painted Moonclan Grots to fill out the battleline units. Who knows maybe for Blood and Glory in November I’ll aim to have a full Ironjawz army on the table. Hopefully for the end of the week I’ll be able to get some army pictures up and might even be able to squeeze out one practice game before the tournament. (That would be a first). We are back with Episode 6 of the Tales of Sigmar podcast, this episode we're a man down as Adam is away but Chalmers and Dan chat about their recent games using the General's Handbook, focusing on armies, chat hobby progress, finding out certain units aren't battleline and answer a bagful of questions from you the listeners. So the great Hobby Wobble of 2016 has hit me full on like a freight train. 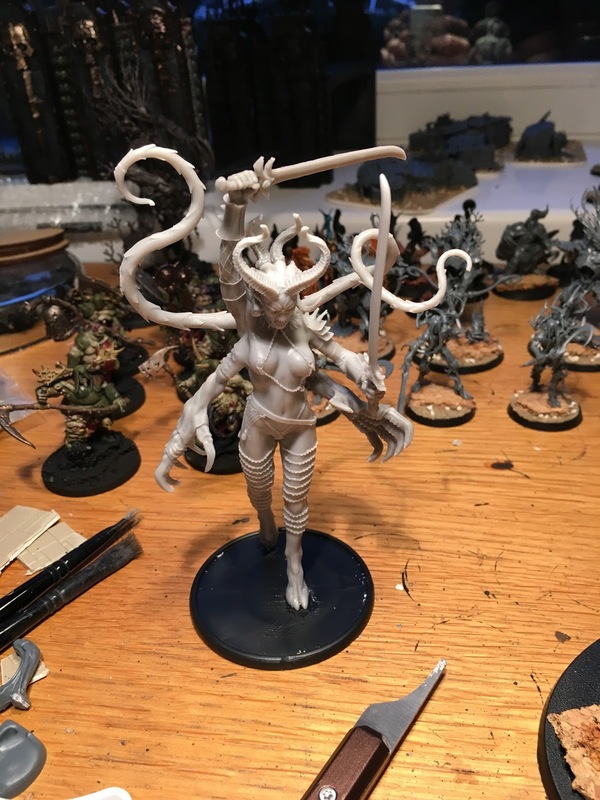 After buying all my Slaanesh models I got to work on getting them all built up and assembled. The first ten Daemonettes were easy and then I had the joys of pinning the Mierce Miniatures into place, this was actually pretty easy to achieve and gave the models a much more solid base. But then I came onto my nightmare…the Slaanesh Exalted Chariots. The chariot frames and the Seekers were rather easy to put together but then I got to the spiked wheels, each set of spikes was completely separate, needing mould lines removed on each side of the spike and then every piece needed gluing together. I completed the first one after quite a considerable amount of time, my enthusiasm drained a little bit but I persevered dug in and got gluing it together. No matter what I tried it seemed like the two rows of spikes just didn’t want to line up correctly with the frame and just as I thought I’d cracked it with one row, then the other row was completely out of shape! After half an hour of fiddling and many profanities, I finally had something that resembled the chariot on the box, though not exactly correct, but worst of all my enthusiasm for getting the Slaanesh ready for Facehammer GT was gone. The thought of having to sink even more time in making another two of these Chariots was not looking very appealing to me and with a strict deadline I didn’t have the time to faff around with these. So it was back to the drawing board, the Slaanesh have gone in the cupboard and will return after I’ve got the Facehammer GT out of the way. So I had just over six weeks, I needed something easy to make and paint while also being fun to play….enter Beastclaw Raiders. Yep I’ve jumped on the bandwagon of the new shinies and got myself a Beastclaw army. I’ve wrote a couple of lists but I’ve settled on one that comes in at 11 models. Yep you read that right 11. So I ordered the Beastclaw Raiders Icewind Assault box set, another Thundertusk box and thankfully had another still in wrapping from my Ogre Kingdom days of 8th Edition. My aim for this army was to have it tie in with the rest of the destruction forces and I thought the best way to do this was making all the Ogors into Orruks by swapping out the heads. 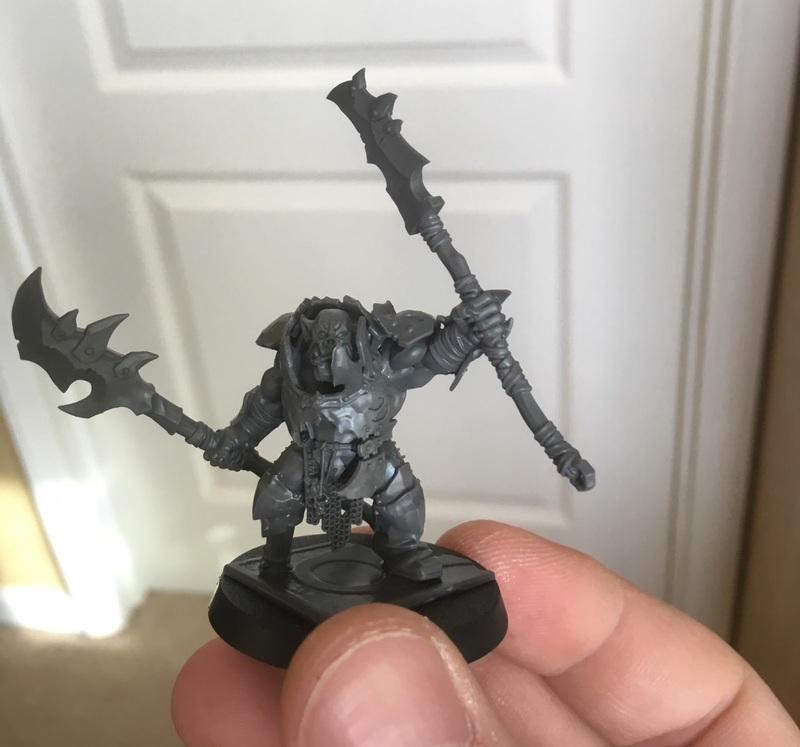 After Bristol Smash earlier this year and seeing a couple of Ogor into Orruk armies I knew it was what I wanted to do and apart from a head swap everything else stayed the same. 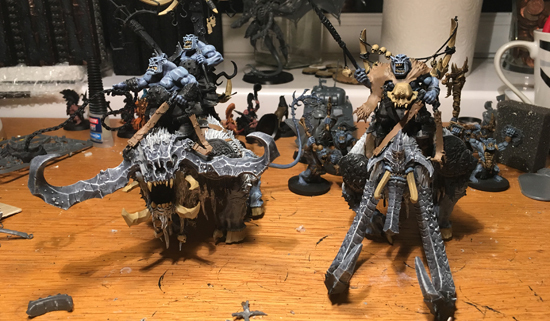 To fit in with the snow theme that the Beastclaw have I’ve decided to paint up my Orruks with blue skin and have purchased the new Shattered Dominion bases and basing kit to add to the character of the army. My aim is to have random parts of the basing kits showing on the floor while the rest is covered by snow and dead grass tufts. Having the army look like they’re marching over a fallen city in the winter. 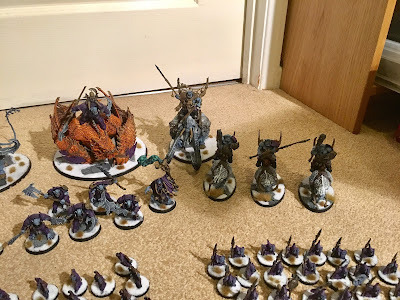 So 11 models in six weeks sounds quite easy to do for an army…. Well it would be, but my army for the Facehammer GT doesn’t stop there, oh no. You see we need to take two lists to the event and use them both throughout. 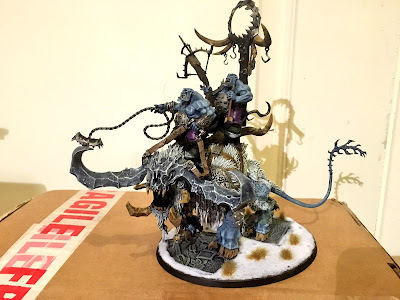 So I’ve decided to embark on the ambitious task of making my second list a mixed Destruction force using Bonesplitterz, Ironjawz and Beastclaw Raiders. 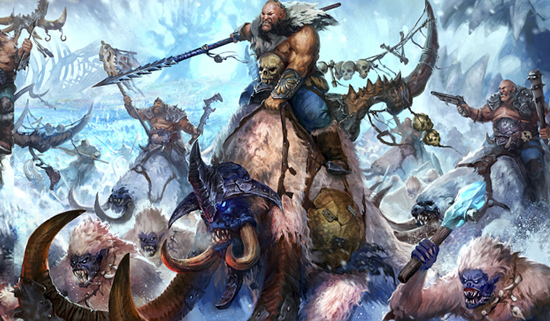 This is why I wanted the Beastclaw to fit in with the rest of the army, with them all looking like Orruks and having the blue skin on snowy bases I think the whole army will really look cohesive on the board, despite being a mix of units from the Destruction allegiance. 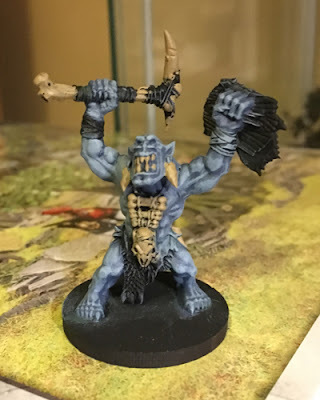 I’m already looking past this event and wanting to incorporate my Moonclan Grots into this army and making them have blue skin too. This second list is going to be the challenge to get ready in six weeks as it’s a lot more models. Going into a split list like this I needed to find a Battleline unit that could be used, hence the Savage Orruks from the Bonesplitterz. 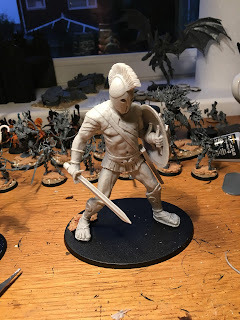 I’ll be producing a second article outlining how each army list is going to look like and the reasons for the choices so stay tuned for that early next week. I’ve also got some ideas for Beastclaw themed terrain to take to the event, we don’t necessarily need to bring scenery to the event but there’s the opportunity to win prizes if we do bring themed terrain. So I’ve already got some snowy hills being made up, along with this I’m thinking some reptile tank skull pieces mounted on card and then having snow drifts up against them. My other idea is the main altar from the Arcane Ruins set and having that part covered in snow. These are obviously the last of my concerns on getting ready, the main part at the moment is getting those armies built and painted up. Design Us A Logo - Win a Battletome! Want a Battletome of your choosing? Well then read on. We need one of you awesome people to design us a new logo for the podcast. We want something that can be used on T-Shirts and Dice in the future, something that embodies the site and the podcast. The winning design will be chosen in the first week of September. 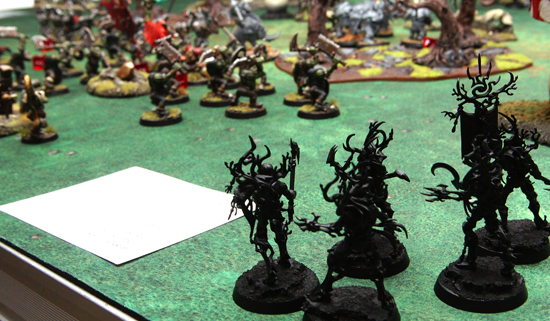 So on Wednesday night I had my first Matched Play since the General’s handbook came out and it was the first time of running my Sylvaneth as an army in itself. 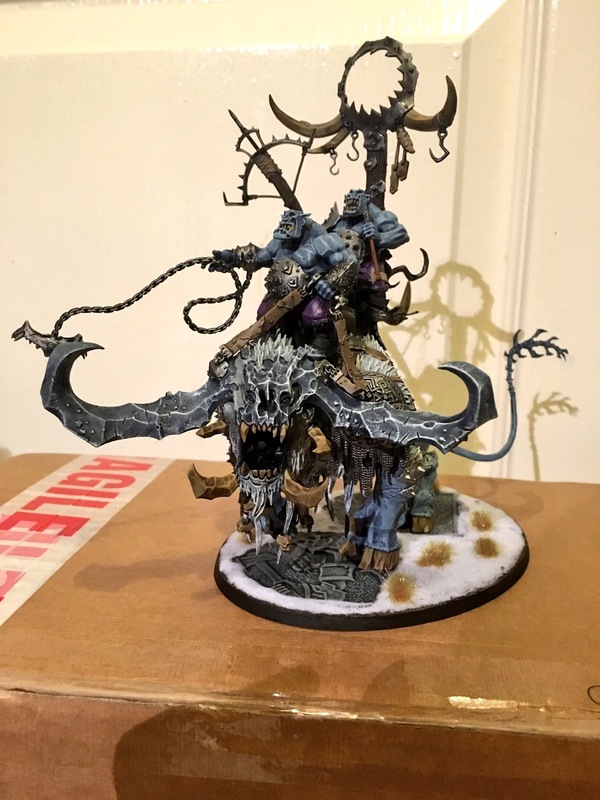 I played against Graham Shirley (PaintedbyG on Twitter) and his beautifully painted Orruks, he’s a phenomenal painter who’s won numerous awards and it’s always a joy to face off against them. We played the first mission called Take and Hold where there was an objective in each deployment zone and you needed to capture them with 5 models or more and no enemy models. We decided to run the Realm of Life Time of War plans so every hero phase we rolled a dice and on a 6 we could place a Sylvaneth Wyldwood on the table (handy for me, not so much for G). We also had to roll for Nurgle’s corruption where units within 1” of terrain pieces suffered a mortal wound on a 6. The forces we ran were as follows, both armies came in at 1980pts so no one got the chance to roll on the table for having less points. Word had been sent that the Orruk Red Skull Boyz had entered the Crawcrook Grove, smoke clouds could be seen billowing in the distance where the wanton destruction of the landscape had already begun. 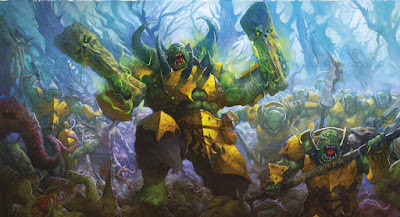 The Treelords dispatched a wargrove to investigate and repel the Greenskinz before they ruined their home, the powers of Nurgle had already corrupted half of the land and they couldn’t bear to suffer even more loss to their sanctuary. As they travelled the sprit paths and reached the point of where the ruin originated they were met with a mass of Greenskinz, it was adamant that this army was looking for a fight and were willing to destroy anything in their path. The general stood out from a mile away, waving a massive bone banner about on top of a snarling boar he shouted orders to his allies and drove them into a frenzy. The power of the Waaagh magic was strong in the air and behind the general stood two Shamans seemingly feeding off the power of the Orruks surrounding them. 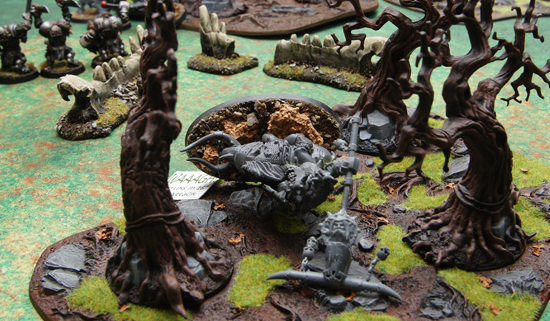 Behind the brunt of the army stood two warmachines, it seemed like grots were manning this catapult and if the sight of the Sylvaneth were not playing tricks on them the catapults were being loaded with grots themselves. The Treelords couldn’t be distracted by these pieces of artillery though as a foul stench filled the air, by now they were used to the smell of the corruption of Nurgle, this was something different. Very quickly the source of the disgusting odor was apparent as three troggoths backed up by the colossal Troll Hag - Mog of Eternal Stench came into view. It looked like the lure of a fight was too much for these troggoths to resist and came to aid the Orruks on their quest for destruction. 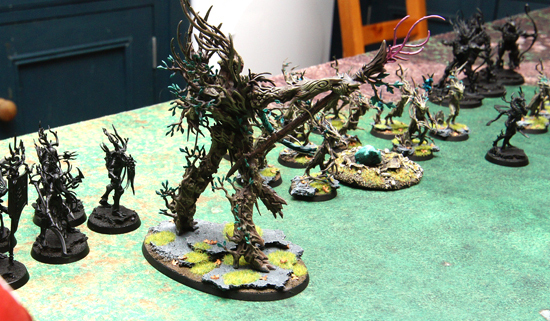 To make matters worse two of the Sylvaneth ever-seeds had been uncovered by the Greenskinz and now lay exposed in the land. These pods of pure energy are pivotal for the Sylvaneth to regrow this land after Nurgle’s corruption. Thankfully the Orruks didn’t understand what these glowing pods were but the Treelords and their followers were not going to wait and see whether the Orruks decided to find out what was inside them. Knowing they needed to reach the ever-seeds post-haste the Treelords ordered their forces to march straight towards the Greenskinz. 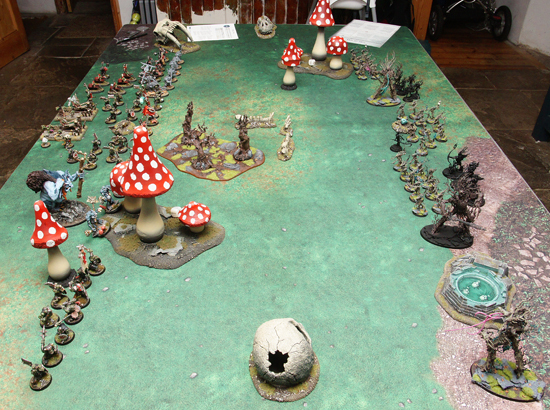 The Tree-Revenants played their waypipes and walked the spirit paths reinforcing the flank where a lone Treelord stood. They fully expected the Orruks and the troggoths would soon be marching in their direction and needed to support the youngest of the three Treelords that had gone to battle today. The Treelord Ancient knowing they needed to slow the Greenskinz advance as much as they could, called to the forests spirits. With a shift of earth and rubble the land in front of the Treelord was now thick with trees and thorns as a Wyldwood now filled the open space. The Orruks looked on confused how could this Tree control such forces of nature, this didn’t stop their advances as they raced forward towards the oncoming Sylvaneth. Their march was halted though with an almighty sound, the Wyldwood directly in front of their army started to shake as a piercing scream burst out from the trees followed by hundreds of Flitterfuries. The source of these ravenous insects soon came into view as Drycha Hamadreth came straight out of the Wyldwood to face off with the whole Orruk army. The Flitterfuries swarmed the Orruk mob and as the clouds of insects parted the majority of the Greenskinz were stood their more enraged, a few of the boyz from the Orruk unit next to the Shaman and General lay on the floor covered in bites and stings but bar that all Drycha had managed to achieve was paint a huge target on herself. Seeing one of their main threats neutralized the Orruks saw their opportunity to strike at the Sylvaneth, on one flank the troggoths moved through the woods in the direction of Durthu, the size of the Troll Hag meant she was an easy target for the Kurnoth Hunters, numerous shots from the Greatbows rained down on Mog but any wounds that were accumulated were sewn back up by her regenerating skin. If anything this just got her angrier as she projectiled her acidic vomit at the nearest Treelord. Branches turned to mush but the Treelord wasn’t going to take it laying down. The weirdnob shamans, Nazgob and Nadsak called forth the power of the Waaagh siphoning extra power from the surround Orruks but the god of Gorkamorka was not looking down on them for this battle. It didn’t seem to matter which spell they were trying to cast they just couldn’t finish the manifestation of the spell without losing their concentration and having to start again. Maybe if the Foot of Gork had been summoned earlier on then this battle would’ve been over a lot quicker, rather though it seemed like Gork was putting his feet up for this battle and letting the Greenskinz fight it out themselves. The Spirit of Durthu swung through with his sword and sliced one of the troggoths in half before the dumb beasts could even react. Such was the force of his swing the sword went through the troggoth and landed into the leg of another leaving him severely wounded. As the troggoth tried to realize what was happening one of the tree’s massive talons pierced his midsection lifting him into the air momentarily as blood oozed out. As it crumpled to the floor the Spirit turned his attention to the final troggoth but sensed something was right, the previous creature was obviously too dumb to notice his fatal wound and picked himself up, bleeding profusely but still looking for a fight. 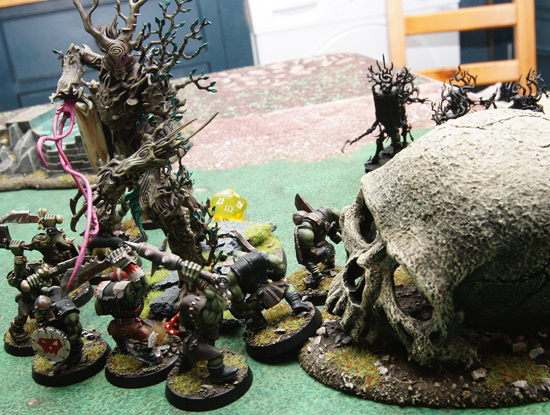 Gutspilla pointed at the Treelord Ancient, who seemed to be organising the Sylvaneth, which he wanted bringing down by the two Doom Diver catapults, the grots acknowledged the request, more in fear of being cut down there and then if they questioned their general’s motives. Both Grot pilots directed their cargo true but the Treelord Ancient wasn’t going to be thwarted by these lowly grots and swatted them out of the air into a nearby Wyldwoods. The sounds of screams filled the air as the ever-deadly Wyldwoods feasted on the unfortunate souls. 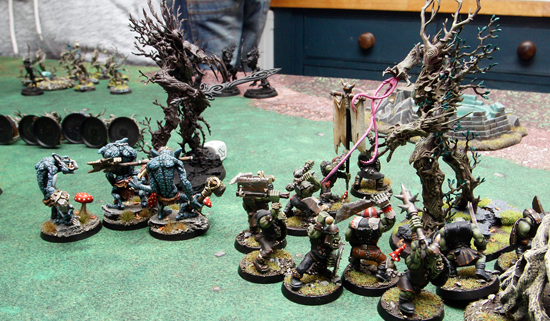 Meanwhile the youngest of the Treelords intent on getting revenge on the Troll Hag charged straight into the Orruks that were supporting her, his Strangleroots extended from his staff and throttled the first Orruk to get in the way. 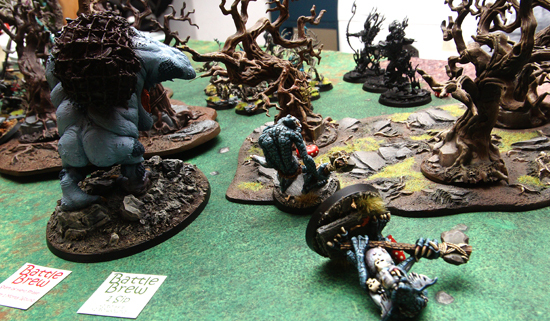 He threw the body to one side ready to tackle the remaining Greenskinz but despite the huge sweeping blows that the Treelord could achieve the Orruks bloodlust took over and managed to bat away each attack. In return they hacked away at the Treelord, the naivety compared to its ancestors was apparent as it assumed these Orruks couldn’t do anything but soon the weight of attacks was too much and the Treelord was take down. In one last attempt of restoring some pride he swung his staff out in one last arch and before the life left his body six Orruks were crumpled. Now the Troggoths and Orruks had marched forward the Tree-Revenants saw their opportunity for reclaiming the ever-seed from the Orruks hands. Playing their waypipes they traveled through the spirit paths coming up behind the Orruks ranks and right next to the Doom Divers and the unit of Boyz trying to crack open the ever-seed. With a prayer to the Everqueen the Revenants charged into the Boyz, what they hadn’t anticipated was the General waving his banner in the air and warning them of the forthcoming attack. 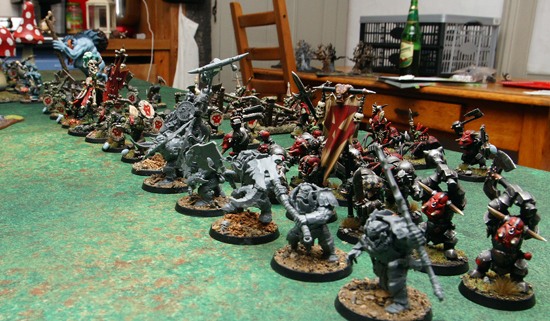 Before the Revenants could swing their enchanted blades the Orruks swiftly dispatched in a frenzy of choppas. Trained and highly skilled with his Guardian Sword, The Spirit of Durthu was hacking chunks of flesh off both the troggoths and the Troll Hag, Mog. Unfortunately it was to no avail as the skin of his foes was regenerating as quickly as he was hacking it off. Even using multiple Verdant Blasts he couldn’t shift his enemy, slowly but surely the Spirit of Durthu grew tired and seeing the opportunity the Hag downed half of the bottle of her Battle Brew that Nazgob had brewed for her. Reinvigorated she matched Durthu with strength and speed and as Sword and Staff clashed Mog showed why she was known by her nickname Eternal Stench and vomited straight into the warped face of Durthu sending him crashing to the floor in an almighty timber as his existence became no more. Speed and ferocity that was the Orruks game, the Brutes and Ardboyz on the right flank swiftly ran up the board and cut straight through the Dryads. 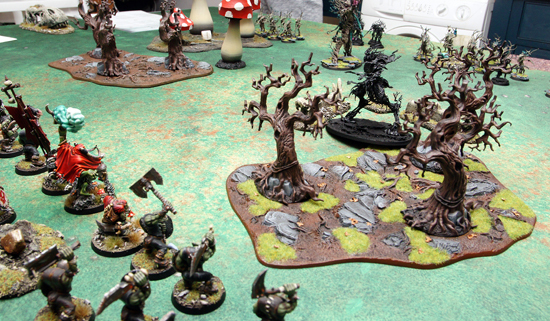 The Treelord Ancient turned his head for one moment to give orders to the Branchwych and the next time he turned around his Dryads were replaced by Ardboyz and Brutes. 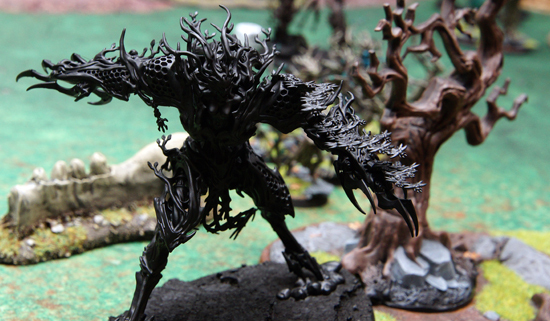 Knowing that they had no chance of reclaiming the ever-seed that was securely in the hands of the Orruks and with their dwindling numbers the Treelord Ancient commanded the remaining Sylvaneth to protect the ever-seed in their possession. 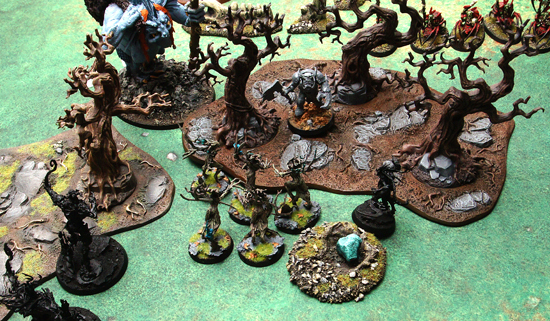 The Kurnoth Hunters came striding over to provide some loyal back up while the Treelord used the rest of his spiritual power to summon two more Wyldwoods right in front of the ever-seed and the incoming Orruk horde. The Treelord Ancient commanded his Kurnoth Hunters to focus all their bows on the General who was commanding the Orruks from the back ranks. 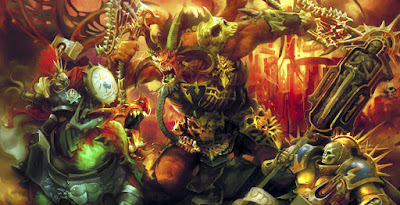 The hope was if they could slay the Red Skull Boyz general the rest of the Orruks would flee in fear. The Kurnoth let their bows fly and arrow after arrow sank truly and straight into the heart of the General. His battle Waaagh cry was cut off mid-sentence as the blood filled the throat of the Orruk Boss before he slumped off his mount and collapsed to the floor. The Orruks halted for a moment seeing their glorious leader cut down but then this seemed to double their efforts in burning down this Grove. One of the Shamans took over control straight away and resumed the barking of commands to the rest of the army. 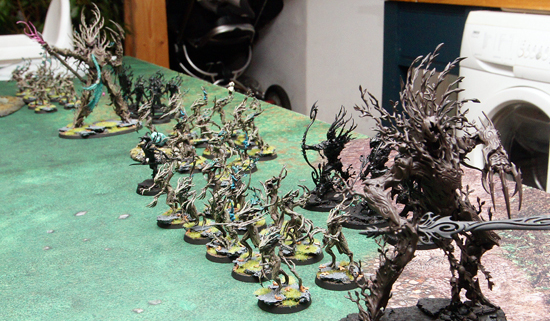 The Sylvaneth looked at each other, their withered numbers were growing smaller by the second. This was going to be their last stand. The Troll Hag and the Troggoths were initially perplexed how these woods and foliage could’ve just appeared so quickly in front of them, but they still knew exactly who was responsible for the general’s death and more importantly where they were. The Hag however was infuriated as these Wyldwoods were too thick and condensed to make a path through; no matter how many branches and trees she smashed apart double reappeared impeding her advance completely. Angrily Mog ordered her Troggoth followers to take advantage of their size and charge through the Wyldwood to crash into the Kurnoth Hunters that were on the other side lining up more bow shots. But by the time they fought their own way through the overgrown greenery only one troggoth remained, the other strangled and pinned down to the forest’s floor by vines and roots. 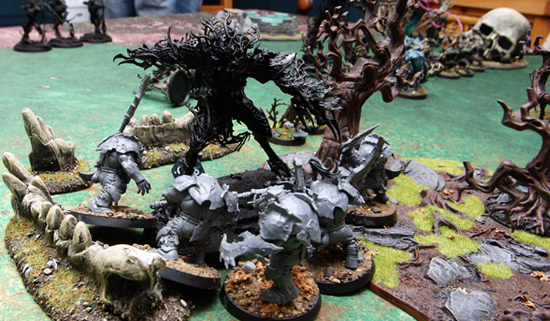 The Elite Warriors of the Sylvaneth dropped their bows and ordered for their Quiverling companions to attack the troggoths, all three of the beasts slashed away with their claws with vigor and left the troggoth a bloodied corpse in front of the Hunters. 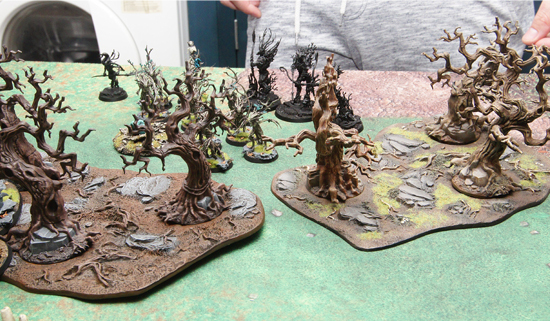 Meanwhile the Treelord Ancient was valiantly defending the other corner of the Wyldwoods, both the Brutes and Ardboyz were hacking away at the general of the Sylvaneth and despite the Branchwych’s best efforts of trying to regrow the lost limbs of the Treelord the weight of numbers soon brought the ancient Treelord to the floor. Knowing victory was within reach the Orruks charged through to the remaining Dryads and Branchwych but yet again the Wyldwoods came to the Sylvaneth’s rescue as only three of the Ardboyz and a Brute remained by the time they reached their intended target. Knowing it was now or never the Branchwych joined the Dryads in one last stand and with a combination of the Wych’s Greenwood Scythe and the Dryads talons cut down the remaining Greenskinz. 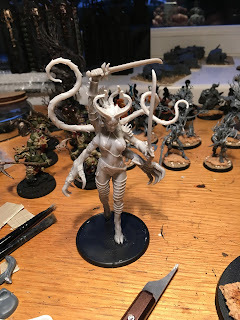 Now in charge of the few remaining members of the wargrove the Branchwych ordered the Dryads and Kurnoth Hunters to travel the spirit paths and take the ever-seed with them. There were still Orruks and other foul beasts by the plenty that were advancing and they knew they didn’t stand a chance of holding out for reinforcements. The last sight the Branchwych saw before disappearing down a Spirit path was the vast amount of Wyldwoods on fire with the Orruks seemingly enjoying this malicious destruction…. So a minor Orruk victory, we both held one of the objectives but the Orruks won the minor victory by killing more points than me. I well and truly got smashed off the table but this was my first game using the Sylvaneth and I was forgetting rules left, right and center. After giving my Treelord Ancient the Verdant Blessing spell to grow Wyldwoods it wasn’t until turn four that I realized the Treelord Ancient now has a special ability that on a 4+ it can set up a Wyldwood within 18”! If I had known that I would’ve taken a completely different spell that might’ve changed the outcome of the battle. Both of our abilities of failing to roll hurt us throughout the game. 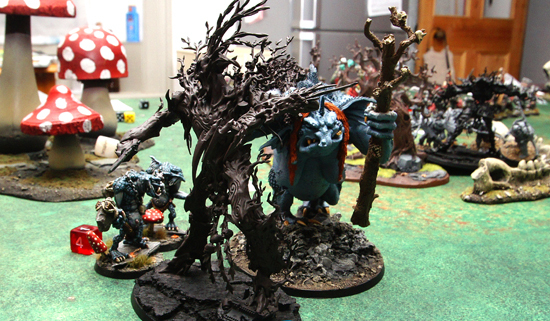 My Treelord fighting 10 Orruks completely fluffed his attacks for two turns, something that in a normal game probably would’ve killed them in one turn. Drycha came out and rolled her 10 dice at each unit within range which was something crazy like eight units and on 80 D6 I managed about five wounds combined! There will be days when Drycha can appear and completely wreck units but alas this battle was not one of them. G was unlucky with his Shamans and Doom Divers, he didn’t manage to cast a single spell with the Shamans apart from one Mystic Shield I’m pretty sure he rolled double 1 three turns in a row, and the Doom Divers managed one measly wound one game. But that Troll Hag with the battle brew making her hit and wound on 2s with her vomit is pure filth. I’m definitely going to be painting up my Troll Hag at some point for a Troll/Firmir Army. 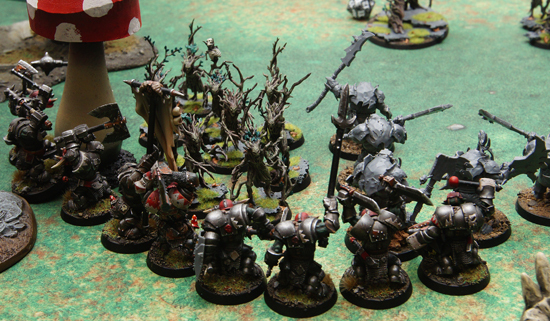 We both agreed the Battleline units being separate hurt them. If you’re paying for three units to have that force organization you should be able to field them how you want. I would’ve probably had the ten holding one objective and then the other two units as one big block of 20. Having three blocks of ten just felt like they didn’t do anything all game. 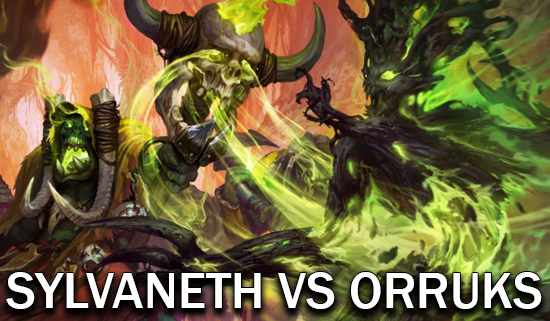 Overall another really enjoyable game against G and a great first Matched Play battle. 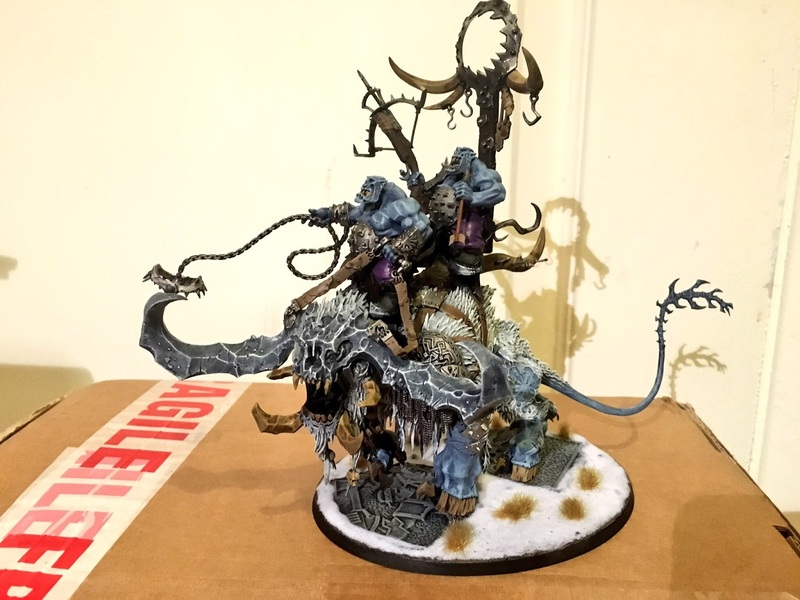 His models are beautifully painted and I cannot wait to see what he does with the Troll Hag once it’s fully painted.